SpongeBob goes on a quest to discover a stolen recipe that takes him to our dimension, our world, where he tangles with a pirate. THE REVIEW: As a little kid, I grew up watching SpongeBob Squarepants almost every night on Nickelodeon. To this day, my brother and my friends endlessly quote the show (no, this is Patrick!) and reflect fondly on the show. I can still watch classic episodes today and be thoroughly entertained and amused by them. However, it’s been a long time since I’ve seen any new episodes and judging by the quality of this movie, SpongeBob has lost the charm and appeal he used to have. Is just as bad, if not worse. Maybe it’s due to the nature of SpongeBob Squarepants the TV show and that most episodes are only about ten minutes long (some are the usual 22 minutes of half-hour programming, but often there’s two separate stories per “episode”). Not only does Sponge Out of Water feel like three individual 30 minute episodes put together, but there’s also a lot of filler inside each chunk. 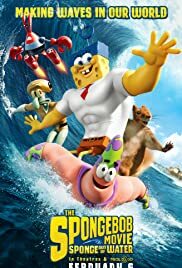 The three chunks are: 1) Plankton attempting to steal the Krabby Patty secret formula; 2) scouring Bikini Bottom to try and find it; and 3) the journey to the “real world” and interacting with Burger-Beard the Pirate (Antonio Banderas — in a particularly poor performance I might add). Yes, the Krabby Patty formula ties all three together in a semi-cohesive way, but it’s very loose. Even with the formula in play the segments have drastically different tones from the heist/action of the opening, the introspective middle, and the ridiculous/trippy ending. THE TAKEAWAY: The SpongeBob Movie: Sponge Out of Water is just sad, really. It’s not like this film has a lot of potential or is on the verge of being something great. Even for a kids movie, this seems like a giant miss with little to no humor and a story that goes all over the place. I would say I might be getting out of touch with what’s left of my childhood years, but when the rest of the audience laughed only sparingly throughout the film, I know it’s not just me. Although, I was the only one laughing when Ennio Morricone’s “Ecstasy of Gold” from The Good, the Bad, and the Ugly started playing towards the end. That moment almost made the film worth it for me, but alas, I still walked out at the end disappointed. The SpongBob Movie: Sponge Out of Water opens in theaters this Friday, February 6, 2015.